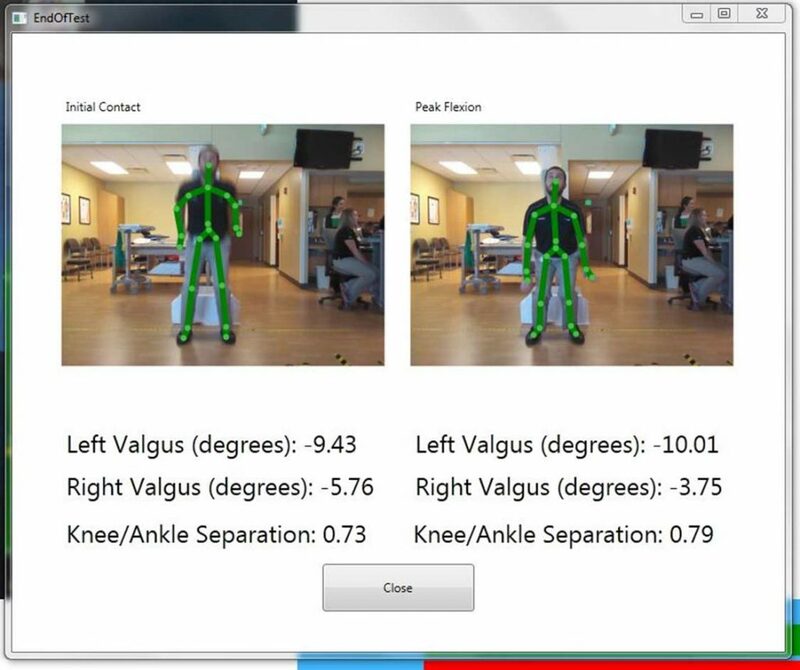 The general objective is to develop and test a prototype ACL Gold computer software utilizing the Microsoft Kinect motion sensor that includes a screening tool and intervention to help prevent ACL tears in female youth athletes. The program measures the knee abduction angle during specific jumping and cutting tasks. High knee abduction angles have previously been shown to be risk factors for ACL rupture. ACL Gold will enable health care providers, coaches and parents to identify athletes at increased risk of suffering an ACL tear and begin injury prevention programs on those athletes. These programs typically incorporate exercises that improve core strength, decrease single leg dominance, increase hamstring strength. Develop the ACL Gold screening software which includes a user interface and instant reporting of knee angles during the Drop Vertical Jump. Perform a feasibility survey of high school athletes to evaluate the potential use of a video game intervention that incorporates ACL injury prevention exercises and immediate biofeedback on landing/cutting technique. Willis BW, Razu S, Jahandar A, Gray A, Skubic M, Sherman S, Blecha K, Guess T. “Gender Differences During the Modified Star Excursion Balance Test.” GCMAS, Poster Presentation. Memphis, TN May 2016. Sherman S, Willis BW, Guess T, Gray A, Skubic M, Blecha K. “Mass Screening of Youth Athletes for High Risk Landing Patterns Using a Portable and Inexpensive Motion Sensor Device: Efficiency, Gender Disparities and Continued Validity of the Xbox Kinect for Assessing ACL Injury Risk. ACL Study Group. Are, Sweden. March 13-17. 2016. D. Gray, J. M. Marks, E. E. Stone, M. C. Butler, M. Skubic, and S. L. Sherman, “Validation of the Microsoft Kinect as a Portable and Inexpensive Screening Tool for Identifying Acl Injury Risk,” The Orthopaedic Journal of Sports Medicine, vol. 2, 2014. Stone E, Butler M, McRuer A, Gray A, Marks J & Skubic M, “Evaluation of the Microsoft Kinect for Screening ACL Injury,” Proceedings, IEEE 2013 International Conference of the Engineering in Medicine and Biology Society (EMBC), Osaka, Japan, July 3-7, 2013.